This is a continuation of the Air Superiority Fighter Competition Continued by @exbyde. Something something about kerbal war, something something, we don't know, it's global now, and various factions are throwing planes up in the sky at each other for reasons. This is probably the most rigorous BDA dogfighting competition out there, with the loosest rule set promoting maximizing combat aircraft potential. We only care about one thing: to build the most superior dogfighter. Every battle (that is run by me, personally, at least) is closely examined to be able to identify and rate a fighter's performance with intricate breakdowns. If you're willing, you'll become very familiar with how BDA works and how the AI functions, as well as its various quirks, and how to apply such knowledge to dominate most other BDA competitions. So this is like Top Gun, for BDA. In my opinion, only 25% of the actual construction makes a good BDA fighter. 30% is the weapons carried and how they are used, and 45% is the AI pilot settings. Ready? This is a King of the Hill style challenge, but with changes, making it more of a "Hill or Valley" style. Two tiers of aircraft will be maintained, the 'hill' and the 'valley'. General participant entries, depending on subjective pre-match judging, will start testing against the Tier 2 #6 or from the bottom against the #10. If the #6 is defeated, the aircraft will continue testing upwards against the Tier 1 board; if the #10 is defeated, it will continue testing upwards through the Tier 2 board. If the aircraft does not defeat the #6, it will continue testing downwards against the Tier 2 board, until it defeats an aircraft or ultimately does not place. Veteran participants will have their entries start their test run against the Tier 1 #5, following the same rules. Therefore, the competition has rolling admission with no deadline for submissions. Fights will be conducted on KSP 1.4.x with BDAc 1.2.x. Privately testing your aircraft against other competitors in AI only dogfights is not only allowed but encouraged. AIRCRAFT BUILT IN 1.3.1 WITH BDA 1.0 ARE NOT VALID IN 1.4.x WITH BDA 1.2. There is a maximum 100 part count and 20t limit. Armor settings (per part) must be at default (0). Armor plating (the BDA part) is not allowed. 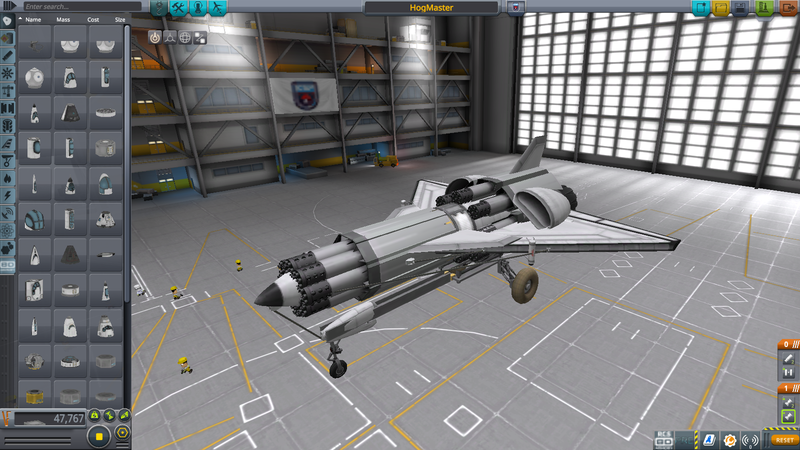 Once you have submitted an aircraft, you may modify the file in KerbalX until the first battle is run. No further modifications can be made after that time. You are welcome to remove aircraft before testing. Once an aircraft has made roster, it cannot be removed from the roster by administrative action and will continue to test, for fairness to other competitors. You are welcome to submit a design as many times as you like, if you modify it. Please note variants (fighter 2, fighter 2a, fighter mkII, fighter mark 2, fighter "somewordshere", fighter AUSF B, etc.). They will be subjected to the Replacement Rule if applicable (see Rules of the Leaderboard). Rule 2.2g of forum rules (and all other rules obviously) applies here! You may not use vulgarity in any language. This includes in the name of your aircraft. If i can throw the name of your aircraft into Google translate and it becomes something vulgar, it will be disqualified. BDA 1.2 for KSP 1.4.2 is the current competition environment. (TENTATIVE) DCK is also part of the competition for its hitpoint editor function, as aircraft will be set to [to be determined]% of hitpoints before combat. EditorExtensionsRedux is highly recommended for greater control over aircraft construction. Also to be able to toggle 'All Rigid' and 'All Autostruts' to reduce need for struts and general wobbliness. The mod list for this competition is generally open-ended, however, it is preferred to keep mod count to a minimum. We highly recommend Airplane Plus, though it is not a required mod. TweakScale is also permitted. Ask first if you are using a mod outside of our common list, especially parts that include new weapons, shields or armor. 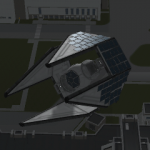 Mods that contain parts that introduce tactical advantages, such as radar invisibility, may be permitted if part of a larger package, but said parts are not. Judges may ask for part removal based around mods that do not serve a combat purpose, or are not usable by BDAc. This includes Infernal Robotics, Attachment systems, and ejection seat modifications. If you wish to be a judge, Kerbal Konstructs and WorldStablizer is required. At no point can more aircraft be present on the tracker in BD Armory than what was originally placed on the runway; i.e., no parasite aircraft. (Tenuous) There is no weapon limit. Fighters will begin in a standard formation arrangement on starting runways at combat locations. (Frontmost left center line, Middile right edge line, Rear left edge line). All official battles are to be conducted at 'standard' unbiased locations (refer to location listing). Battles are currently conducted by having start points at the KSC runway and the island runway. Fighters will sortie out against each other in missions of 3v3 maximum. There is a maximum of 1-plane-count difference; 1v3 sorties are not valid, rendering defeat for the team with only 1 aircraft left availble. Battles (defined as the full series of sorties between two aircraft types) are fought until sufficient depletion of one team's aircraft reserves, with victory awarded to the team with more remaining reserve aircraft. A unit will begin its combat debut with 7 aircraft in reserve. This reserve number will be affected by defeats or margins of victory after every sortie. Reinforcements are granted after every sortie based on amount of enemy aircraft killed, on a 1-to-2 basis; 1 additional reserve aircraft is granted for every 2 killed opposing aircraft. Reinforcements can only be granted to replace lost aircraft, with the maximum reserve amount remaining at 7. Surviving aircraft are not subtracted from the reserve. Surviving aircraft are defined as flyable by the BD AI in a stable manner, and retain some wing surfaces and an engine. Fuel is not necessary. If aircraft battle for 5 sorties with no apparent victor, a sixth, final 5v5 sortie will decide the results. Sortie #1 filmed from neutral ground observer (location beacon); this reduces the effect of the game physics by staying in a neutral frame of reference (explanation here) essentially creating an unbiased battle. Sortie #2 filmed from offense team; this is for observing the combat performance of the up-and-coming craft, against an opponent that has already been observed and analyzed. Sortie #3 filmed from defense team; switching sides for fairness, as well as observing combat performance of this craft versus a new opponent. Sortie #4 switches back to offense team, and etc. Veteran competitors are those who have achieved Tier 1 Rank 3 at least twice, or achieved Rank 2 or Rank 1. Alternatively: ASC veterans, you know who you are. The Tier 1 Leaderboard is open to anyone. It is called the Veteran Leaderboard due to the high-competitiveness of the aircraft in this leaderboard. The Tier 2 Leaderboard is also open to anyone, but imposes restrictions on Veterans. A Veteran may not place in this board if at least 2 spots are held in Tier 1. A Veteran aircraft that has placed in Tier 1 cannot drop down into Tier 2 if pushed downwards after a defeat; it will be removed from the active leaderboards. Replacement Rule: This rule concerns an aircraft variant of an aircraft already placed on the leaderboard. Should these aircraft battle each other, the winning variant remains on the leaderboard. If the winning variant is the newer aircraft, it will continue testing against If the winning variant is the older aircraft, the newer aircraft will not place and its battle testing ends. Re-Advancement Rule: This rule permits a settled aircraft on the leaderboard to restart its advancement upwards upon defending its position by the number of times it is placed (e.g., #5 defended 5 times). The competitor may choose to challenge the next-placed aircraft at the location of their choice. The battles conducted will be based on a 12-plane reserve flying 5v5 sorties, minimum of 3 required to sortie, no reinforcements granted. If the challenging plane is victorious, it will continue its climb up the leaderboard according to standard Rules of Engagement. Hold on, so if a mod makes fuel more lightweight and makes it burn slower, that's allowed? Off-site leaderboard for ease of coordination between multiple judges. Well, changing of rules is open for discussion, I just copied the rules that made sense. Hmm... With the new HP system's tankiness against Vulcan fire it's a pity we can't use the M230 Chaingun locked forward, it has a nice tradeoff of higher damage vs lower range and RoF. Oh well. For the purposes of making sure craft fit on the spawn runways/don't melt your CPU , is there a part/size limit per fighter/per side you'd prefer people to not exceed? Also, I'd advise caution regarding Aviators Arsenal weapons, since it hasn't really been ported to the new BDAc 1.1+ system; the initial port MM patch I wrote for it was more for the beta and really needs to be updated. If there is significant interest in using AA weapons, i can prioritize getting it updated. Did you miss VulcanStar from the previous thread? Yeah, those rules were just copy+pasted. As for plane-tankiness, DCK will have a hitpoint editor, so that will be resolved to an extent. I'm also considering an edit to the turret rule, allowing them but locked. Why would I have named it VulcanMaster if I'd never seen the Star? That just reminded me, I forgot to impose the 100 part count + 20t limit. I may or may not bring back the Super class. Haha, it'll(probably) be in the limits. VulcanStar was at the limit. It was 100 parts pretty much, but you could probably be more efficient with part counts if all you care about is getting guns in the air, and nothing else. I reached 100 parts due to all-aspect design. all I care about is flying 50 vulcans. Doesn't even have to be a superb dogfighter. Just 50 vulcans. Now that the new thread's up, I'm gonna submit some new aircraft. I'm impressed that it's within the limits. Sluggish, (19.8t, and 2 panthers and 1 tiger) but it gets the job of GAU-8 spamming done. Also, the AI seems to dodge cannon fire now. At least it does the instant its own guns turn on. I may have accidentally linked the wrong doc. which is all of my personal brain ramblings and daily-go-to notes scrap things. i keep a lot of gdocs open because i'm busy. For the first battle of the new thread, we fittingly have the new generation of fighters with Pre-Routing Devices (PRDs) starting off against the Viper. @ZLM-Master's V-TEK faces off against the Viper-ASP MkIIc under the new reserve format. Which would have ended the series in 4 sorties. But it's a good excuse to test out the 5v5s anyways, so that's good enough for me for now. The V-TEK has no outstanding flaws that I can see. Maybe weapon range is still off; still too far on the guns, so it doesn't get all the utility it can out of its Sidewinders. If there's anything else... maybe gun stability? I don't really see a huge issue of it not being able to keep guns on target though. Also, binding countermeasures to the brake action group apparently causes it to dump all of its countermeasures when the AI goes haywire. It's also possibly that the PRD is not as effective as Vampire Squirrel's in keeping the enemy routed long enough for the allied team to move in. But in general, the V-TEK is a very well-designed aircraft. Unfortunately, still not enough. The Viper continues to prove its fairly robust design and flight tuning, which was, again, originally tested against Rabid Squirrel and TFD. The V-TEK does not make the Tier 1 board, and settles in the Tier 2 board at #6, making it the first guardian of the gates to a spot in Tier 2. And a tough guard I expect it to be. One more battle for now. Another PRD-equipped aircraft facing off against the #5. @53miner53's P-5 Flash goes up against Viper-ASP MkIIc. Another well-designed aircraft, and also unfortunately just not enough. It does use its Sidewinders, almost being a pure gunfighter by the time the dogfight actually develops due to it dumping the missiles early on. The PRD does generally do its job. Except for the one mishap that probably costed the P-5s Sortie #2. I'd put the weakness that failed the P-5 in its low thrust, making it relatively sluggish around the airspace, and having a poor ability to rush in and capitalize on the initial confusion caused by the PRDs. It just couldn't manage much control over the dogfight due to the non-afterburning Juno. Viper holds its #5 spot for 5 defensive victories. Which means I'll invoke the new Re-Advancement rule and go and fight the TFD. heheh. P-5 Flash now turns its aim to a spot in the Tier 2 board, which means it'll face off against V-TEK for who gets to stay near the top, and who falls further down the valley. Haha Not bad at all . I could tune the V-TEK for KSP 1.4.X and see he can do . *at least without MLRS. Haven't tested it against any of those. Also, the Du-3 is more maneuverable than the Lancer/Berzekerzer. The Du-3 is nearly as maneuverable as the pike. Pretty much cranking out as many battles as I can while I have the time to. Our first tier 2 match, @53miner53's P-5 Flash is on the offense against #6 spot, @ZLM-Master's V-TEK. Again, the lack of sharp throttle control on the P-5 is its downfall. It can't capitalize on PRD routing, nor run away effectively when chased from behind. Not just that, but the V-TEK's interesting, spaced-out design allows it to shrug off damage from the low-output of the P-5's single Vulcan. A couple of times in-battle, it'll lose an engine or two, some control surfaces. But as long as the main wings are fine, it'll keep flying. One friendly fire kill on the wounded V-TEK in the first round isn't enough to keep the kill count up. P-5s lose too much too quickly without enough kills themselves and can't bring enough reserve aircraft for a 3rd sortie. V-TEK keeps its #6 spot and P-5 settles into #7.